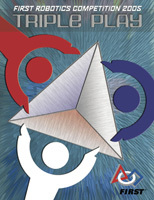 2005's game is called TRIPLE PLAY. In a change from past years, this year involves two competing alliances of three teams each. One alliance is red and the other blue. Going with the Triple Play theme, this year�s game involves stacking tetrahedrons (tetras), four-sided 3D triangles. On the playing field are three rows of three large tetra shaped goals; three at either end, and three across the middle. Goals around the outside edge of the field are 5 feet tall, and the center goal is 7 feet tall. Each match lasts for 2 minutes and 15 seconds. In the first 15 seconds, robots will operate on their own without driver control in a autonomous mode using only previously programmed algorithms and data from sensor input. 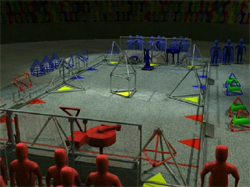 In autonomous mode, the robots will attempt to knock down hanging tetras attached by magnets to the four corner goals or pick up and score "vision tetras". Vision tetras will be placed randomly between the end zones and goals, and will be located with color specific cameras. If a vision tetra is placed on any of the midfield goals outside goals, 1 extra tetra will be added to that alliance�s corner goals. If the vision tetra is placed on the center goal, 2 extra tetras will be added. Robots will gain points for their alliance by capping the goals by putting 28 inch tetras on top, or by pushing the tetras under a goal. Tetras in a goal are worth 1 point each, and tetras on top of a goal are worth 3 points each. Two automatic loading areas on each side per alliance will allow the robots to pick up more tetras to place on the field, or alternately they can go to the human loading station where a human player can place an additional tetra on their robot. The alliance to which the physically highest tetra on a goal belongs is the alliance who "owns" the goal. An alliance gets 10 extra points for every set of three goals in a row that they own at the end of the match (tic-tac-toe style). 10 additional points will be awarded if all three robots on an alliance are completely in their end zone at the end of the match. 40 Teams (.pdf, 24KB) attended the 2005 SBPLI Long Island Regional. 340 Teams (.doc, 277KB) attended the 2005 Championship. 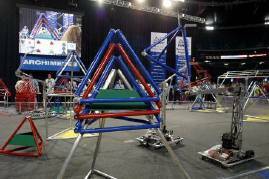 991 Teams (.pdf, 293KB) participated in the 2005 FIRST Robotics Competition at 30 Regionals.